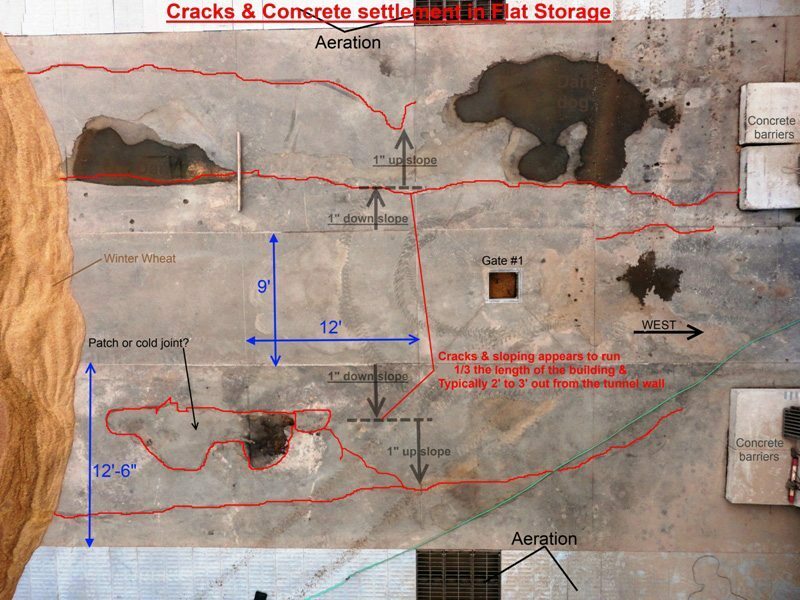 Two identical 1.5 million bushel grain storage buildings, one located in Roscoe, South Dakota and the other in Andover, South Dakota, were experiencing concrete foundation settlement. The overall structure dimensions were 600 ft. long by 135 ft. wide with an arched roof. Below the floor of the storage buildings, a tunnel with conveyance system and a series of aeration tunnels were installed to facilitate moisture control and grain transport. During construction of the facilities, both structures experienced a major rain event and an accumulation of snow prior to installation of the roof system. It is thought that the runoff from both events seeped through the joints where the tunnels and slabs meet causing erosion along the exterior of the tunnels and saturating sub-soils. The area between the centralized conveyance tunnel. The aeration tunnels. Specifically, a 12 ft. wide by 600 ft. long section on either side of the tunnel had settled and cracked. All slabs were 8 in. thick reinforced 3,000 psi concrete. URETEK was contacted to help level the concrete foundation, and stabilize the underlying soils. Soil testing performed showed no specific soil anomalies at depth at either site. Therefore, The URETEK Method® was employed to lift and stabilize the storage facilities. The URETEK Method® is a minimally invasive two-part high-density expanding polymer “foam”. The injection system densifies and compacts the soils beneath the concrete slab, while leveling the concrete back to it’s original level. The URETEK polymer material injected is lightweight yet extremely durable, giving concrete the appropriate support it needs again, while providing a long-term solution. Drilling revealed that soils at the Roscoe location were highly saturated while the Andover location presented as only slightly above normal soil moisture content. Due to the presence of moisture content in the soils, URETEK’s hydro-insensitive polymer material was the best choice for the repair- as it performs well in high moisture and saturated soil environments,along with the strength to support very heavy loads. Both facilities run year round, so due to the time constraints, repairs had to be made quickly during a scheduled outage window. The Roscoe location was the first to be repaired. The URETEK ICR crew met the tight schedule, averaging over 2,000 square feet per day. The facility had a small quantity of soy beans in one half of the facility while the crew was on site. Once one half of the floor had been lifted, beans were transferred to the completed area so work could continue on the other half of the floor. Once the Roscoe facility was repaired, the URETEK crew moved to the Andover site. The Andover work was completed in five days with URETEK ICR lifting and stabilizing approximately 3,000 square ft. per day. Both facilities were back online immediately after the areas were completed. Andover began refilling the storage building within three hours of the departure of the URETEK ICR crew. URETEK was able to stabilize, lift and return to service 28,800 square feet of storage facility in a matter of a few days, at each site, meeting the customer’s need for speed and efficiency. 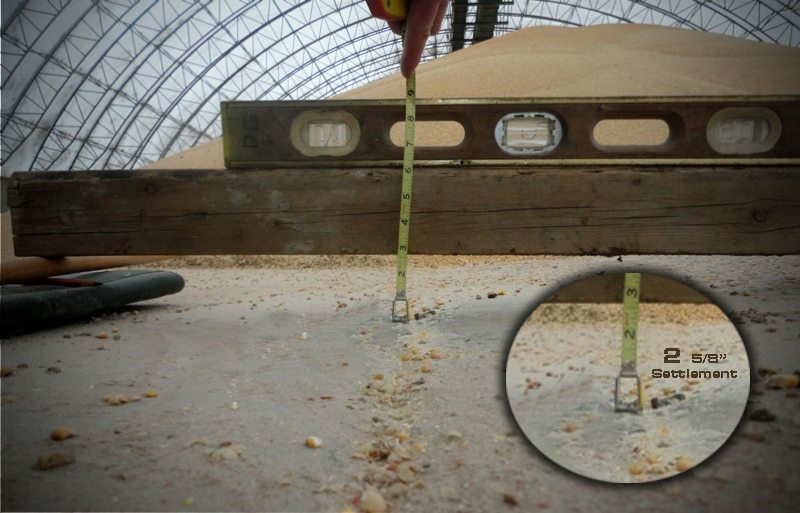 URETEK’s zero-excavation concrete leveling solution allowed the grain storage facility to quickly and effectively repair the settlement problem, restore original design capability, and greatly reduce production downtime. The facility is now better able to handle the high-volume grain loads required without any hesitation. The project was completed within the tight timeline and the client’s budget. Facility downtime was reduced to a minimum. Fast, effective, and clean process for agricultural facility repair. The URETEK Method® was able to successfully lift, level, and stabilize all affected areas of the storage facility and restore the foundation’s load bearing capacity. URETEK’s hydro-insensitive polymer material successfully stabilized in highly water-saturated soil conditions, delivering the client’s desired results.